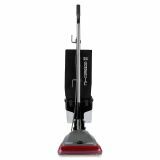 Electrolux Sanitaire Dirt Cup Commercial Vacuum - Powerful lightweight commercial vacuum features a 30' three-wire cord, four-position carpet height adjustment, easy empty dirt cup, and 5 amp maintenance free motor with polycarbonate hood. Offers 12" sweep width. Vacuum meets OSHA standards.